APPLICATIONS: Provides added corrosion resistance for insulation attachments to structural concrete, wood and steel roof decks. Steel thickness from 22 ga (.028 in.) thru 18 gauge with min. 3/4 inch penetration. FR treated: min through penetration: 1/4"
13 threads per inch for ease of installation. APPROVALS: Dekfast fasteners and plates are FM Factory Mutual approved for attachment of insulation board to roof deck. Refer to FM Approval Guide and Supplements for current FM approved insulation fastening patterns. 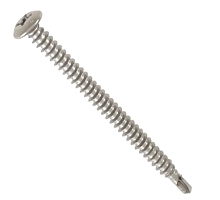 #14 fasteners exceed Factory Mutual corrosion-resistance Standard 4470. INSTALLATION TOOLS: 2000-2500 rpm screw guns with hardened #3 Phillips. #14 from 1-1/2 to 12". #3 X 1 Inch PHILLIPS 1/4 Inch HEX SHANK, ACR RIBBED DRIVE BIT. PRICE/EACH. #3 X 2 Inch (1-15/16 Inch) PHILLIPS, 1/4 Inch HEX SHANK, EXTRA HARD TYPE, DRIVE BIT (PHILLIPS INSERT BIT). MADE IN USA. Makita FS2500, 0-2500 RPM Variable Speed Screwdriver, 1/4 Shank Quick Lock, LED Illumination Light, Adj. Depth Locator, Variable Speed, Reverseable, 6.0 Amp, 110 VAC, 150.5 in/lbs Torque, with 5/16 Nutsetter. Price/Each.